When it comes to success with coaching and training the 70:20:10 method is more than just a fad. A study by business transformation consultancy Towards Maturity found that learners who stick to using the methodology are much better equipped. Using this method, 70 per cent of knowledge comes from on the job activities, 20 per cent is from observing others and only 10 per cent comes from formal training classes. four times more likely to demonstrate a faster response to business changes – 30 per cent versus seven per cent. three times more motivated – 27 per cent versus eight per cent. twice as likely to report improvements in customer satisfaction scores. Taking the experiences of 1,600 learners across the globe, the results form the basis of the recently published 70+20+10=100: The evidence behind the numbers report. The report was unveiled at the Learning Technologies 2016 conference in London in February. eleven times more likely to help staff find what they want through content creation. But it wasn’t all positive as the study found many Learning and Development Heads remained sceptical of the 70:20:10 methodology because it implies formal learning doesn’t work and that it was simply a way to justify cutting training budgets. The survey also showed that some L&D Heads felt the ratio numbers were set in stone. But Towards Maturity said such negative or restrictive perceptions of the methodology were myths which could be argued against. Overton said the findings should and must act as a wake-up call to L&D heads to consider using the model in their own organisations. Currently, just 47 per cent of L&D professionals use the model to shape their learning approach the survey found. This was in spite of the fact another key finding from the survey was that 90 per cent of staff said they preferred to learn from their peers. seven times more likely to use spaced out learning to aid retention of information. As a business improvement organisation, Sales Improvement Services places a great deal of emphasis on helping our clients develop people that add value to their organisations. 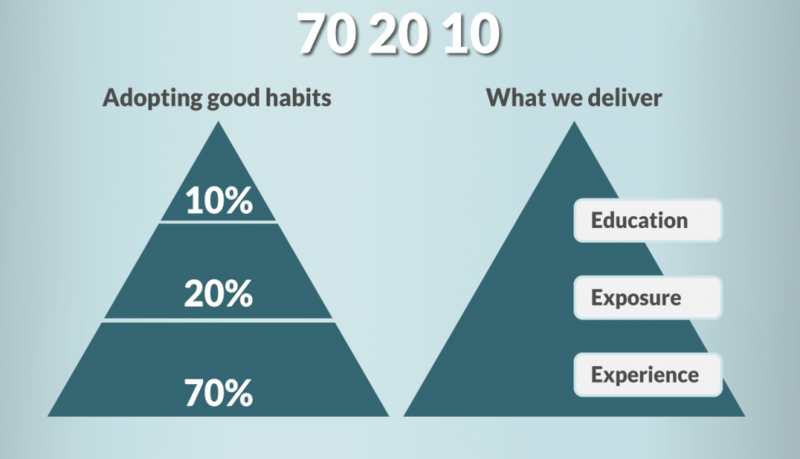 You can watch our video here to find out how integral the 70:20:10 methodology is to the way in which we provide our coaching and training opportunities. Led by Tim Anderson, a specialist coach with more than 30 years experience, Sales Improvement Services is a consultancy practice supporting professional organisations, and those working within them, to meet their respective goals. We provide these services through a range of professional support methods including coaching, consultancy and action based learning, all measured against pre determined business objectives. Our clients range from start-ups, SME’s, education providers, charities, and medium-sized professional organisations.